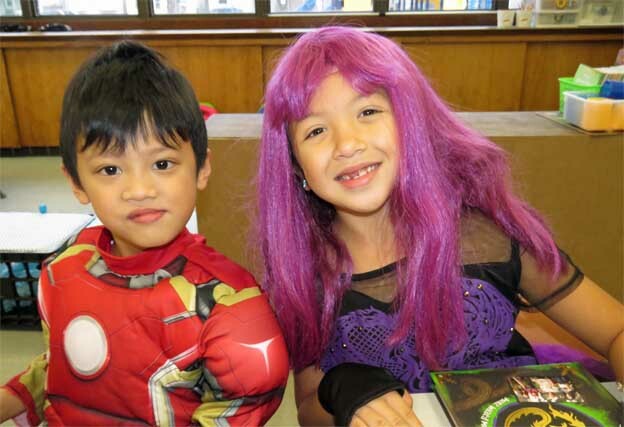 alloween is an exciting day for kids because it means “trick or reatingt” and lots of free candy. 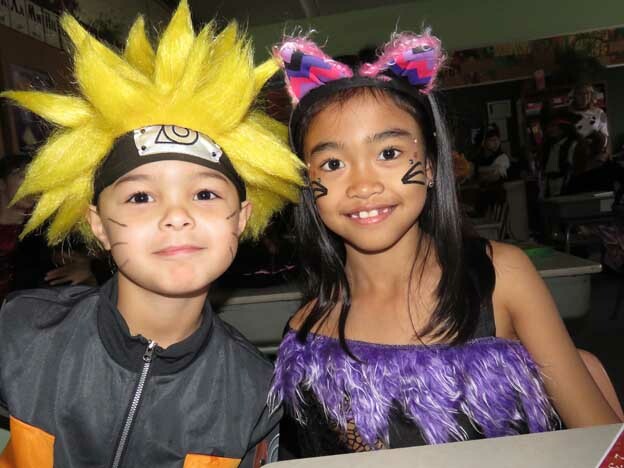 What makes it even more exciting for kids (and a lot of adults) is that it also means dressing up in costume for the occasion! 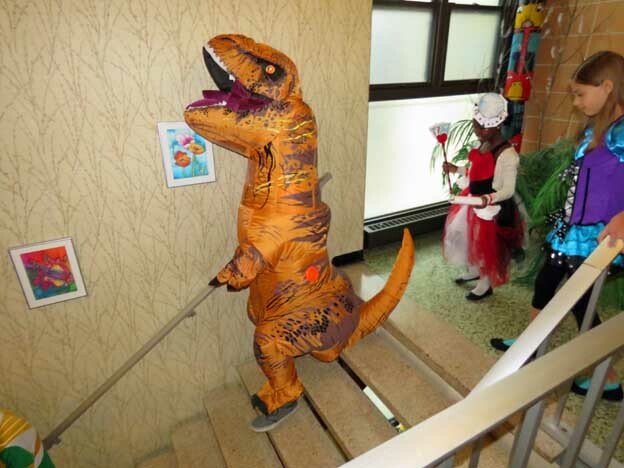 Everyone loves to dress up in some type of funny or creative costume for Halloween. 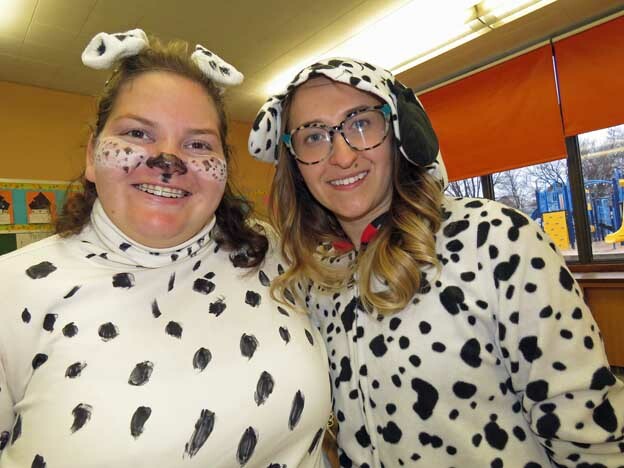 alloween fell on a Tuesday this year, so IHMS celebrated Tuesday, October 31, 2017 with a N.U.T. 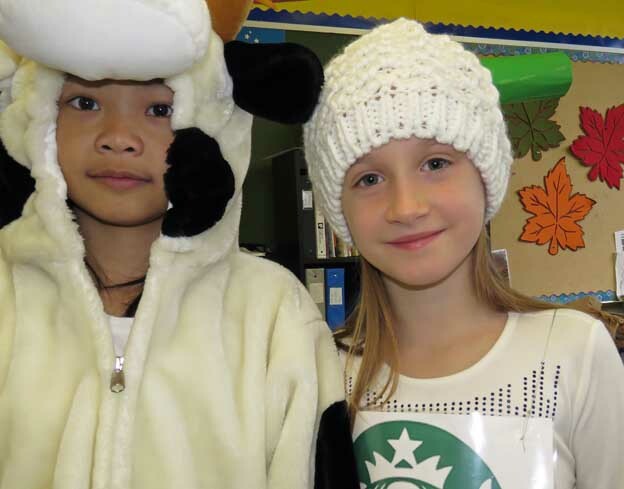 day (“No Uniform Today”). 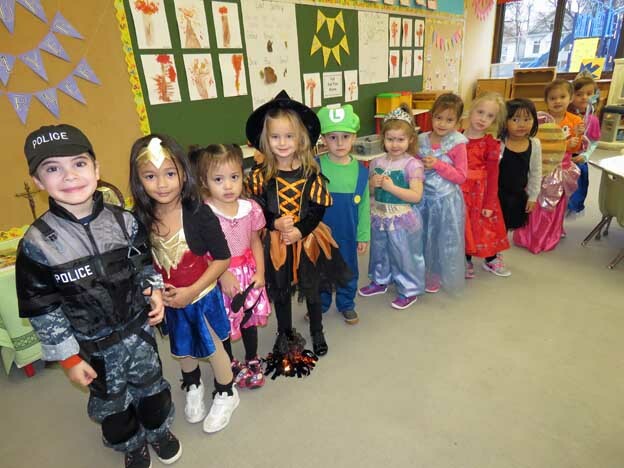 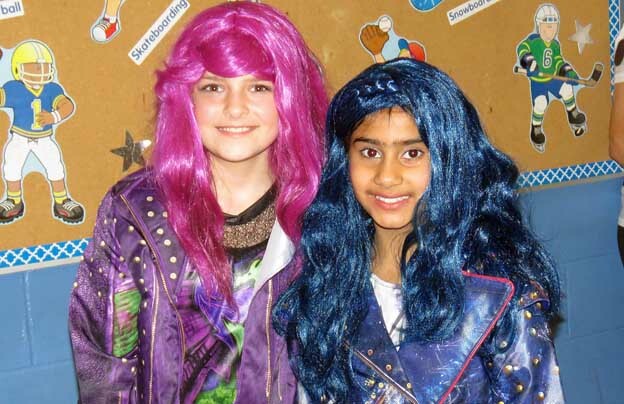 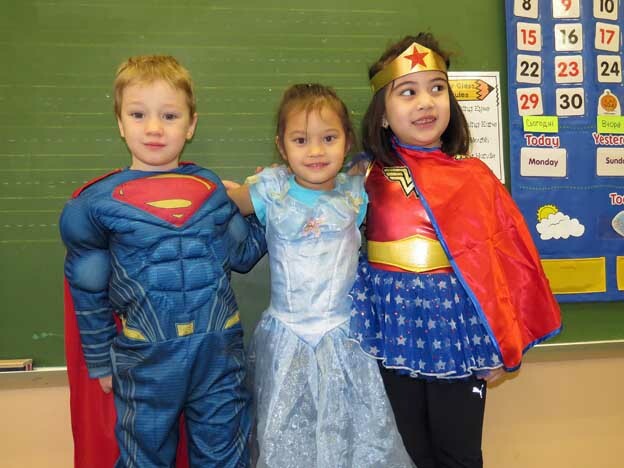 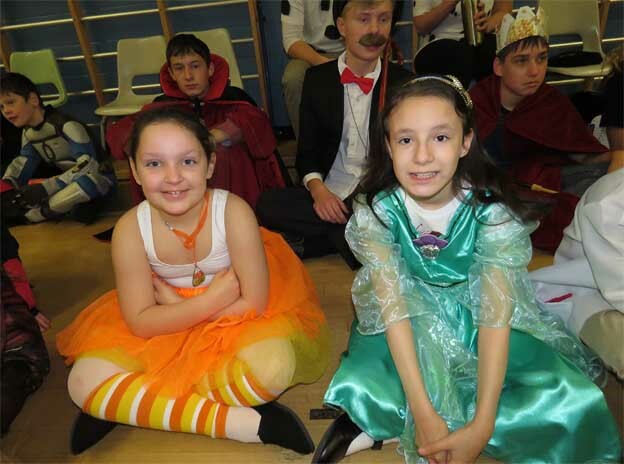 Everyone was encouraged to come to school dressed in costume, and the more colourful and creative the outfit, the better! 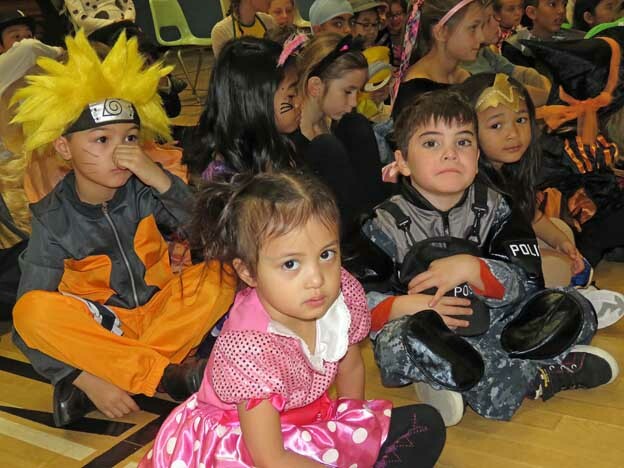 tudents were free to wear almost anything they wanted as long as it didn’t portray anything scary, evil, or inappropriate. 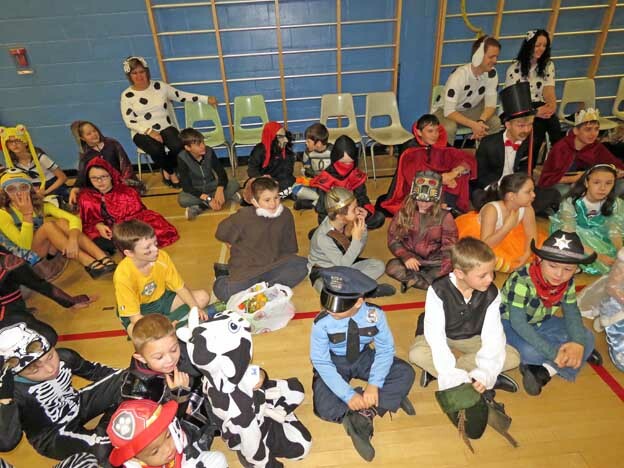 Anyone who either had a scary costume or who preferred not to wear a costume at all were asked to at least dress in orange and black. 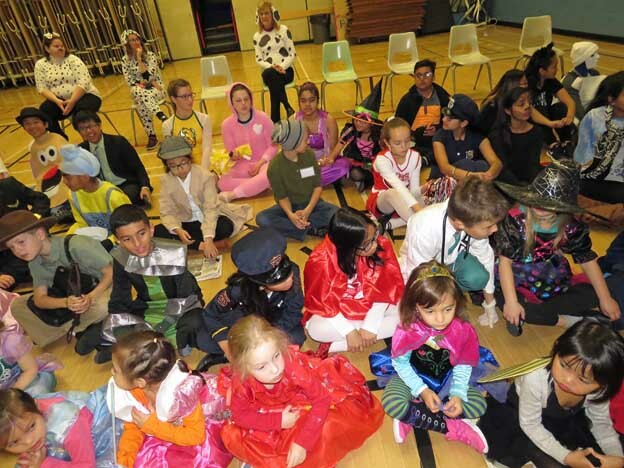 None of the students did this because everyone already had their costumes ready for trick or treating that evening! 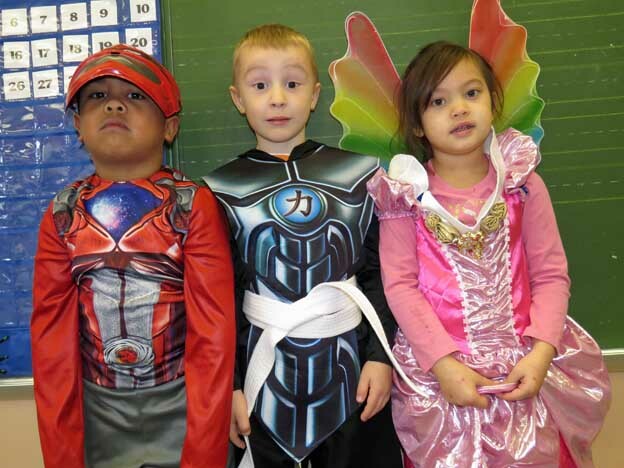 ince Kindergarten students attend school only 3 days a week (on Monday. 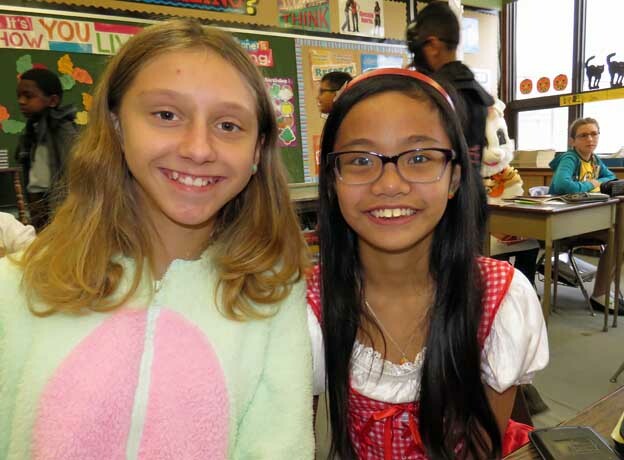 Wednesday and Friday), they were absent on Halloween, which fell on a Tuesday this year. 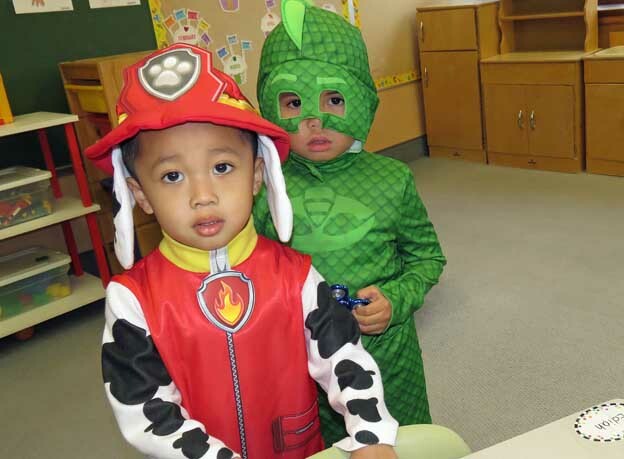 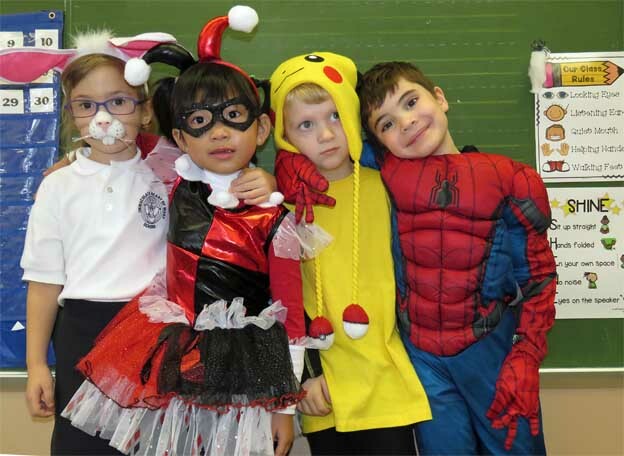 Instead, the Kindergarten students came to school dressed in costume the previous day on Monday October 30th. .
ince everyone was eager to show off their outfits, it’s been a yearly tradition at IHMS for students to parade their Halloween costumes in front of everyone else in the school. 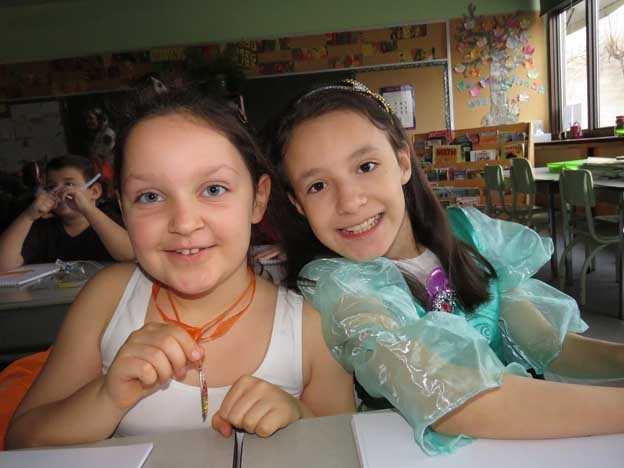 This is done in the form of a procession through each of the classes from Kindergarten all the way up to grade 8. 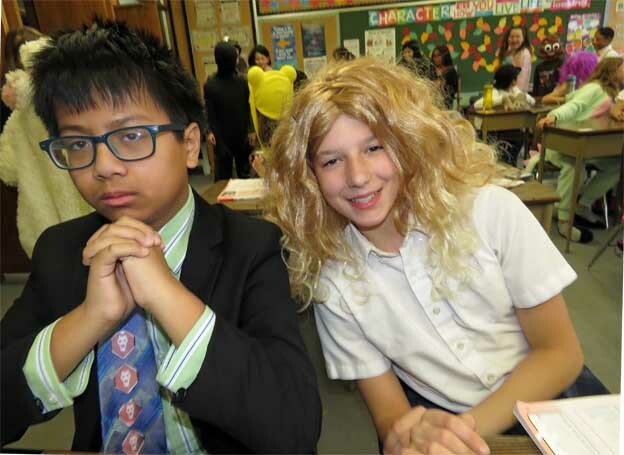 In this way, everyone in the school can show off what they have, and at the same time they can see what everyone else is wearing. 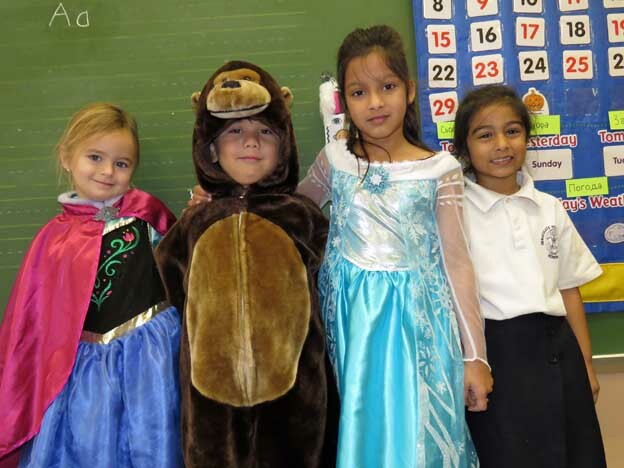 he procession began with Mrs. Paulic and her Sadochok students parading through the grade 1 classroom. 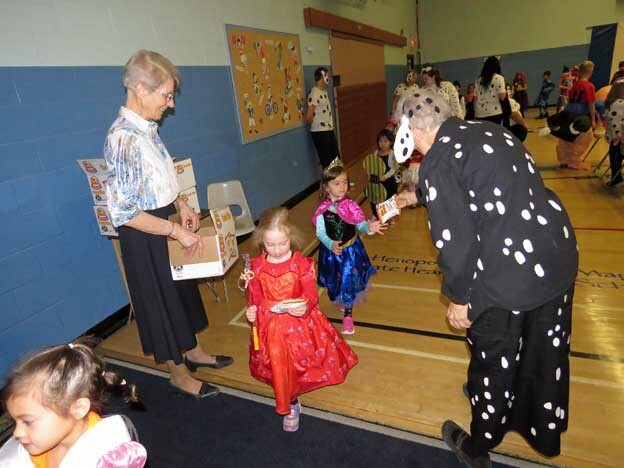 As both grades checked each other out, the grade 1’s followed the Kindergarten students into the grade 2 classroom. 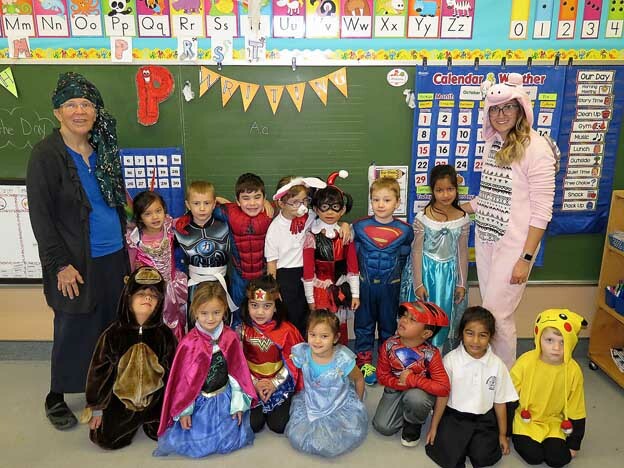 The grade 2’s then followed the line into the grade 3 classroom, and so on. 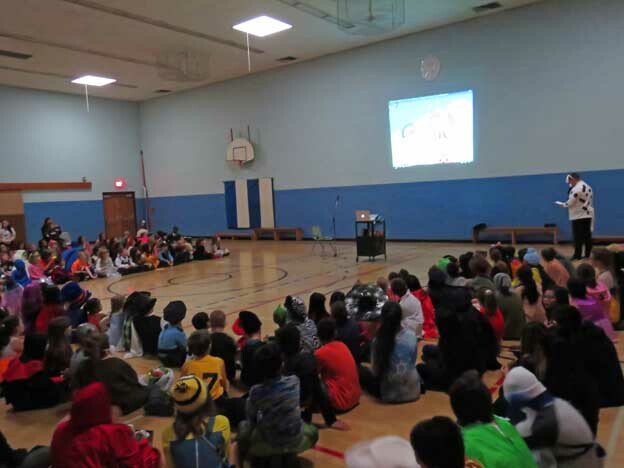 This continued all the way to the grade 8 classroom, and finally back down into the gym where everyone gathered for a short assembly. 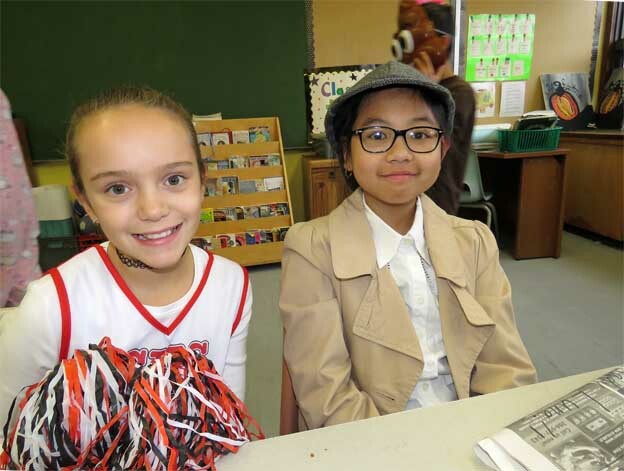 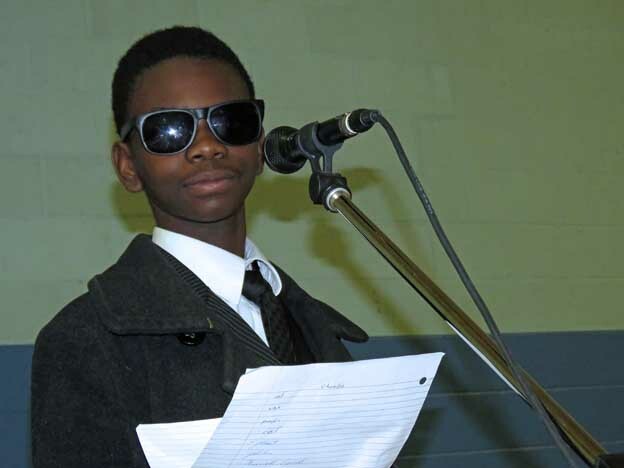 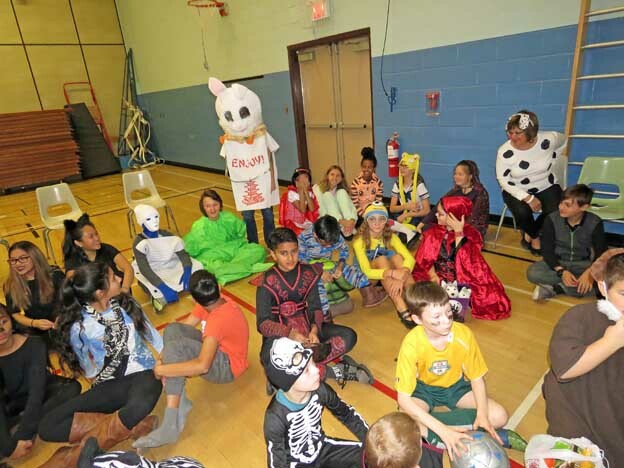 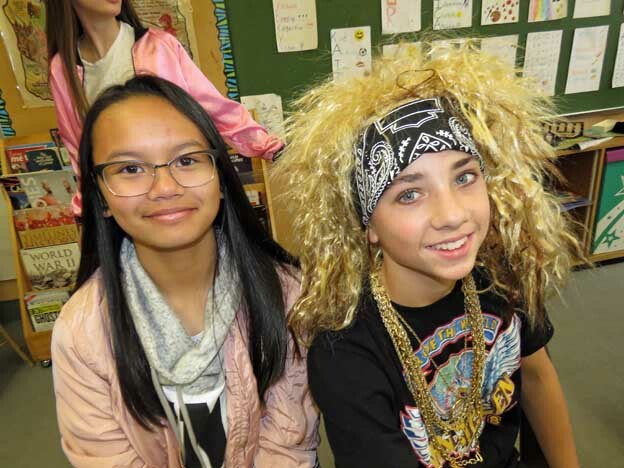 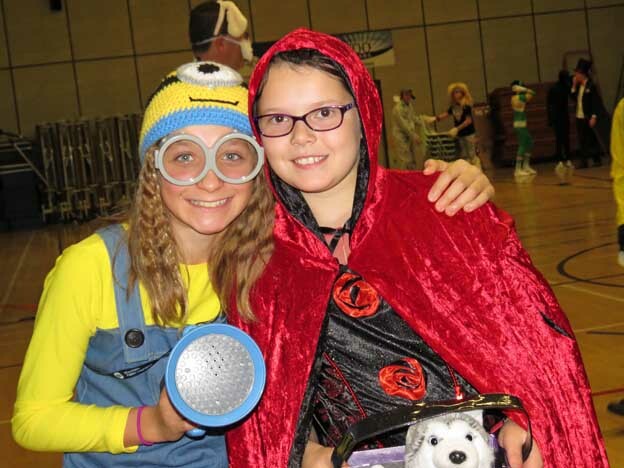 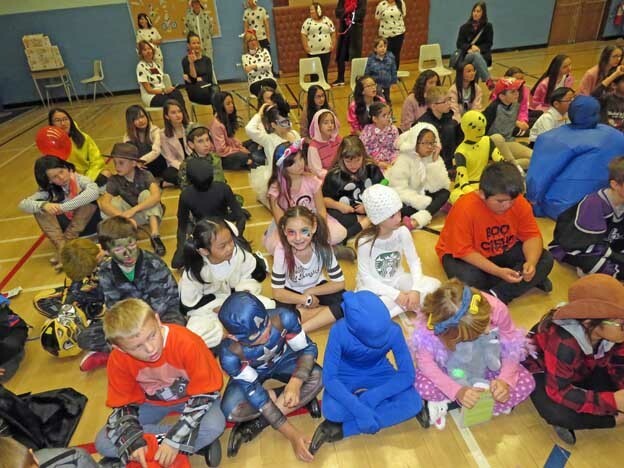 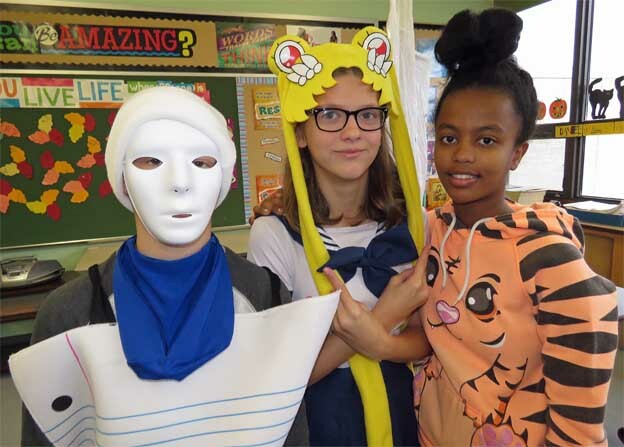 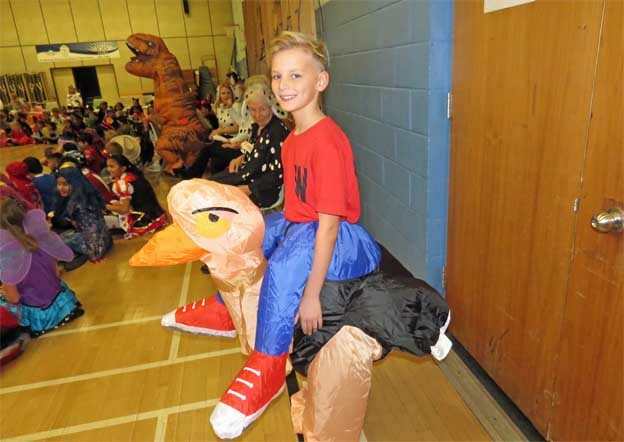 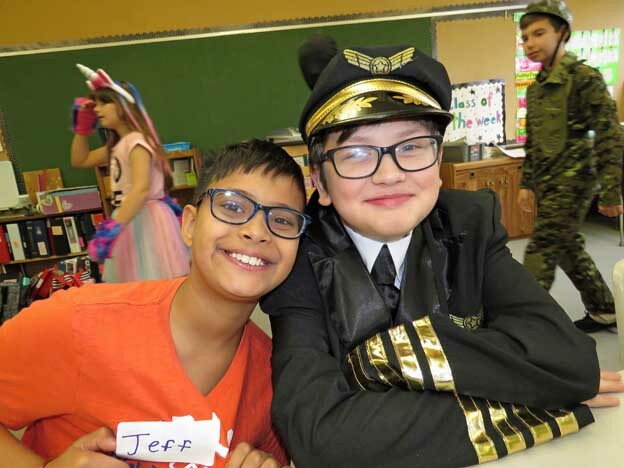 he assembly was relatively brief this year – students didn’t participate in the usual “gym extravaganza” of Halloween activities as in past years. 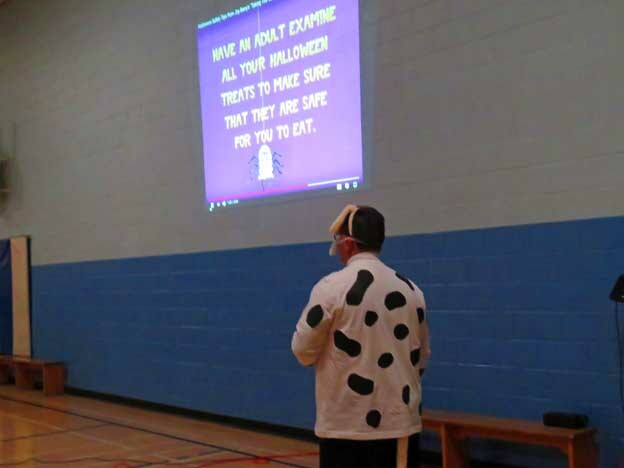 Instead, Mr. Picklyk spoke for a few minutes about the different types of costumes, Donovan M., the student council president, told a few bad jokes, and the students watched a short Halloween safety video. 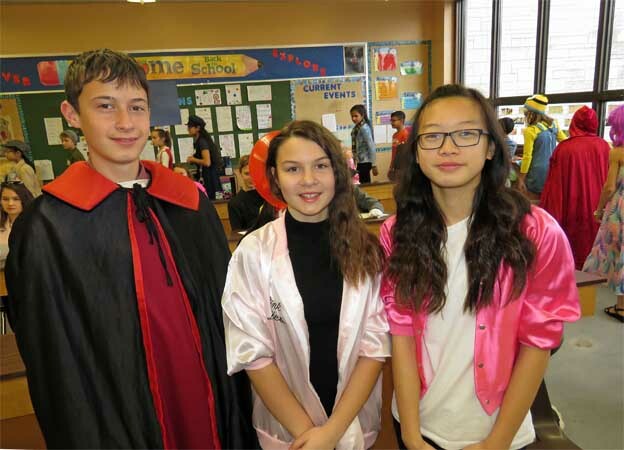 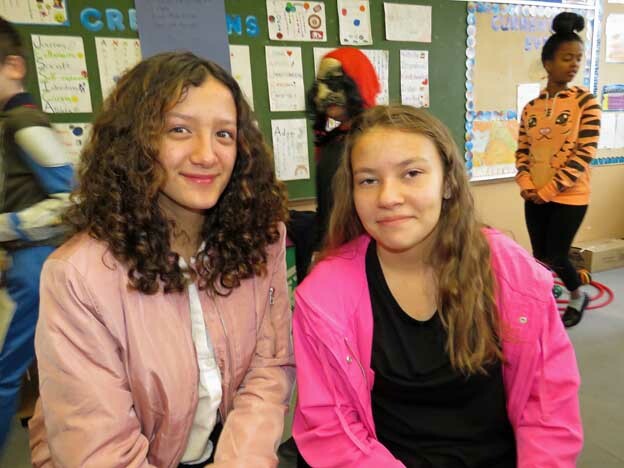 he students were also told that the grade 8’s would be visiting each classroom with a variety of Halloween activities for them to play. 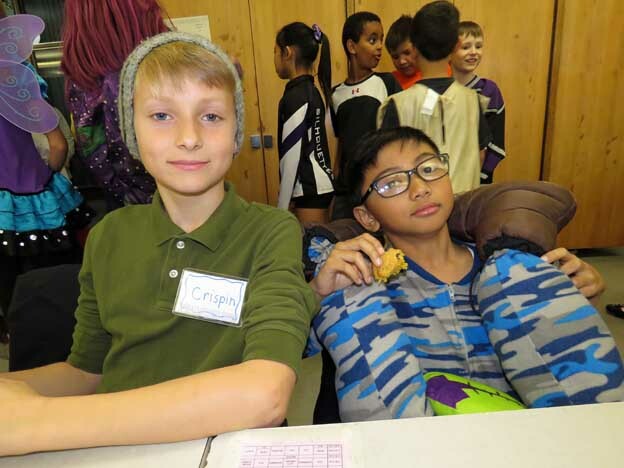 As the students left the gym, they were given a small bag of potato chips to have later in the day during their recess break. 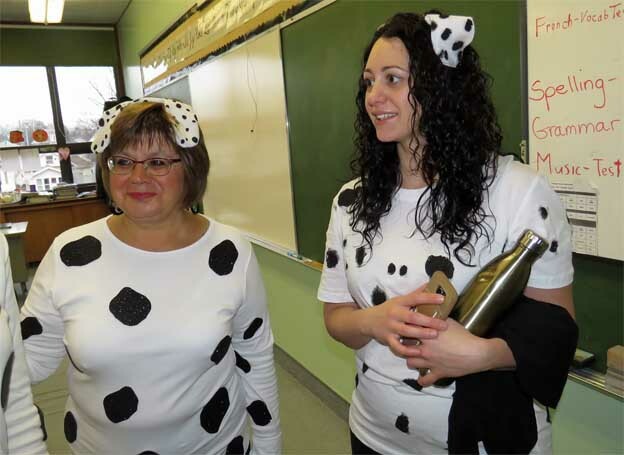 nother Halloween tradition at IHMS is for the staff to come to school wearing identical costumes. 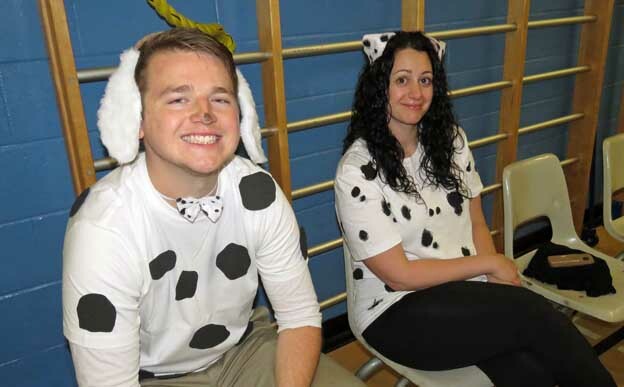 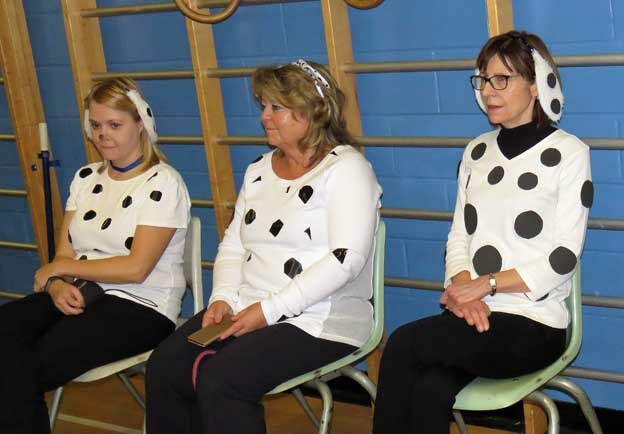 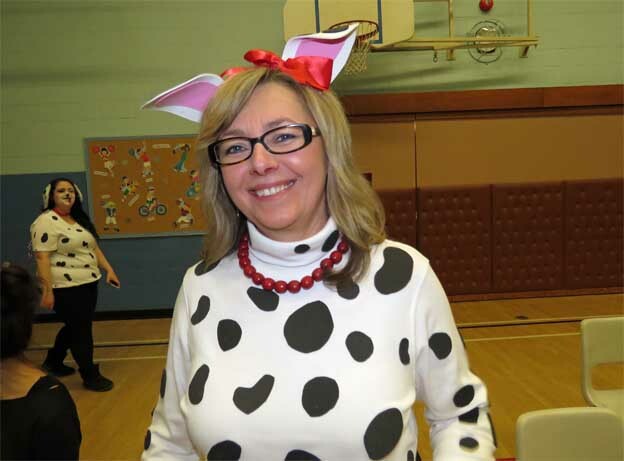 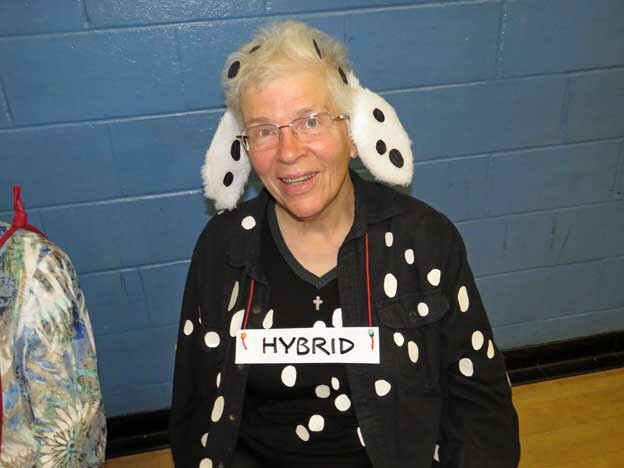 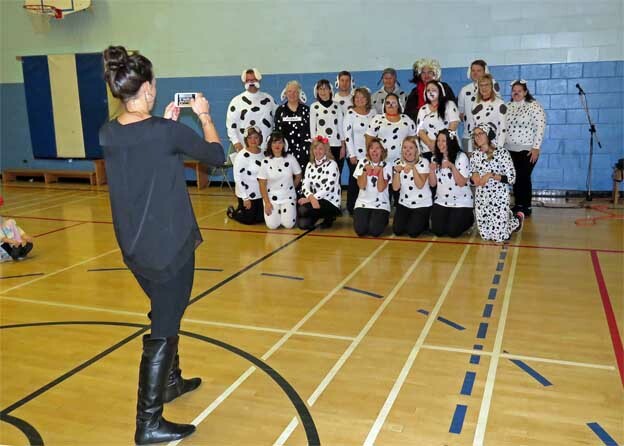 This has been a tradition for the past 24 years, and this year the teachers dressed up as a Dalmatian dog. 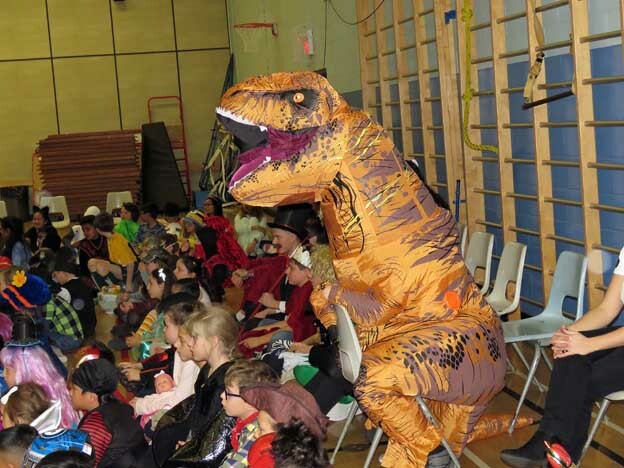 This information was kept a secret until the teachers wore their costumes to school that day. 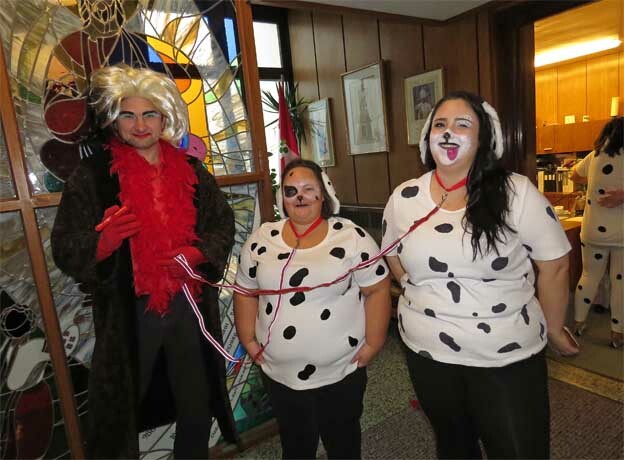 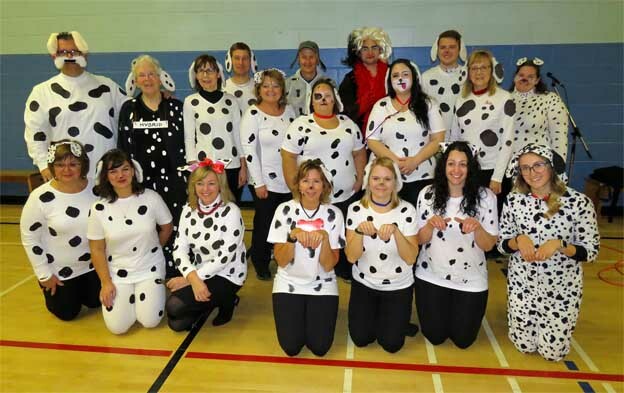 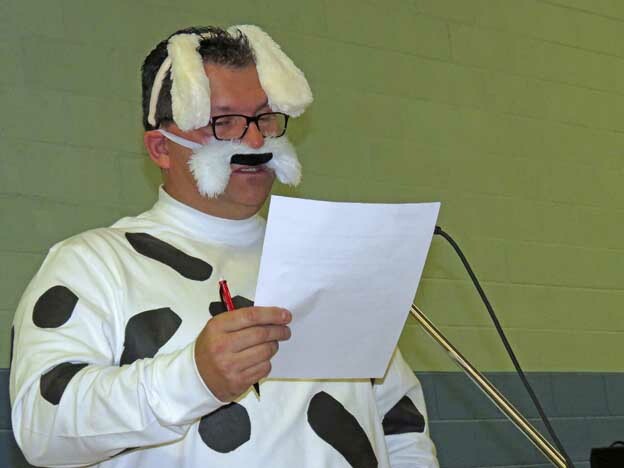 The staff of IHMS chose the 1961 animated movie “101 Dalmatiansas” as the theme for this year’s Halloween costume. 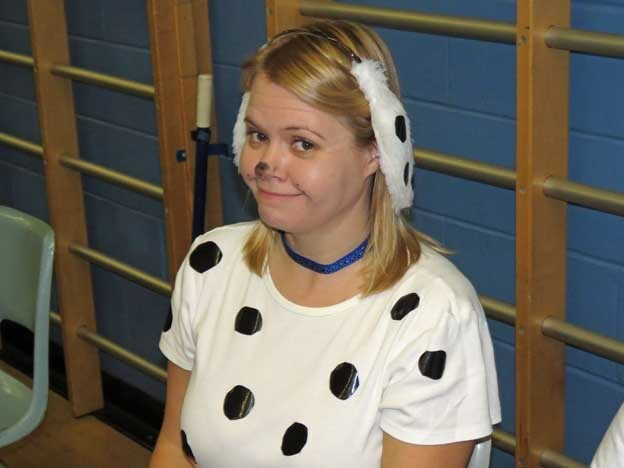 Most staff members wore a white top covered with black spots in order to look like a dalmatian dog. 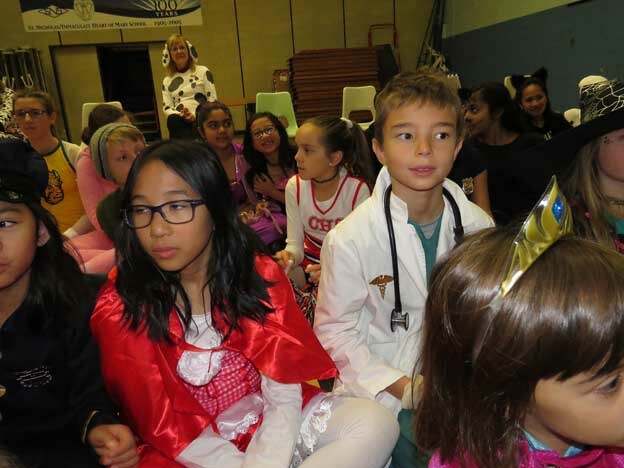 The school’s vice principal, Mr. Trochanowski (seen in the back row), dressed up as the movie’s villain, Cruella De Vil. 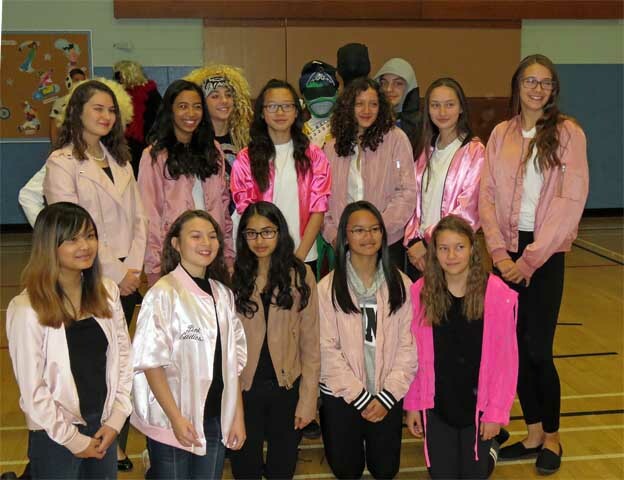 Click on either of the above two group photo to view in a larger format. 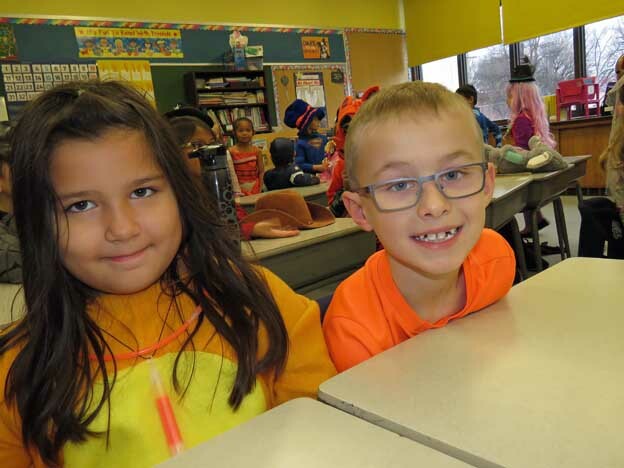 n order to encourage healthier eating habits, Halloween has been declared a “candy free” day at IHMS (there will be plenty of candy later that evening). 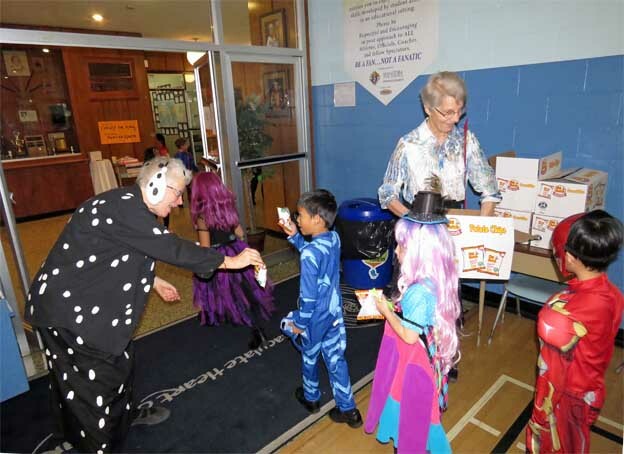 Families who wanted to share a fun treat on Halloween were asked to only bring an inexpensive toy … NO CANDY! 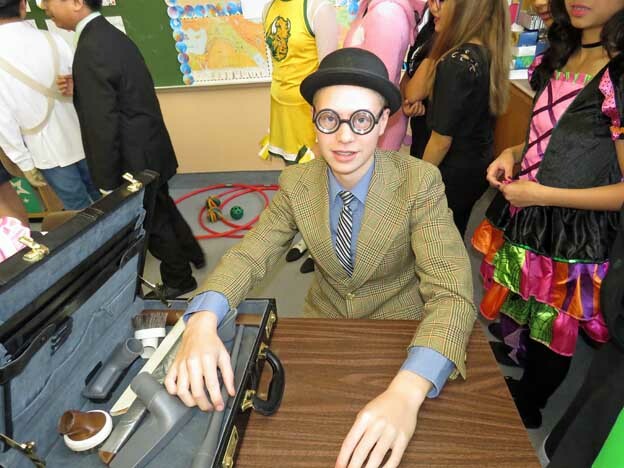 Capish? 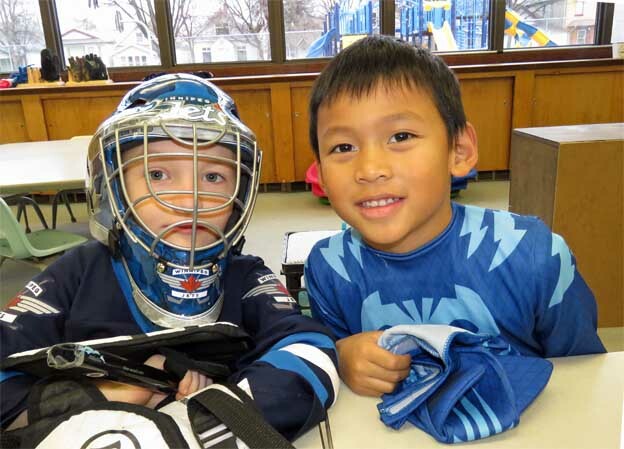 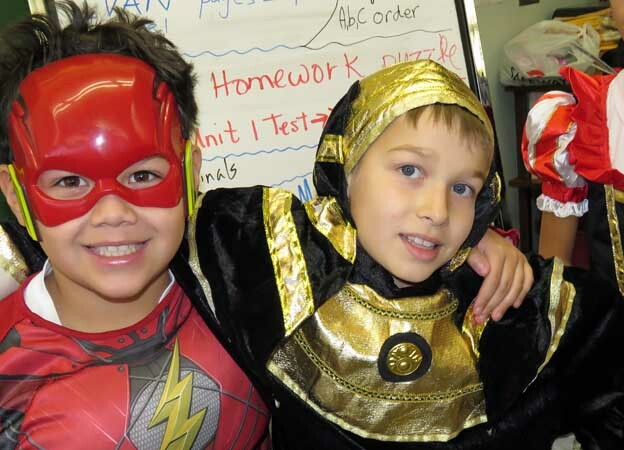 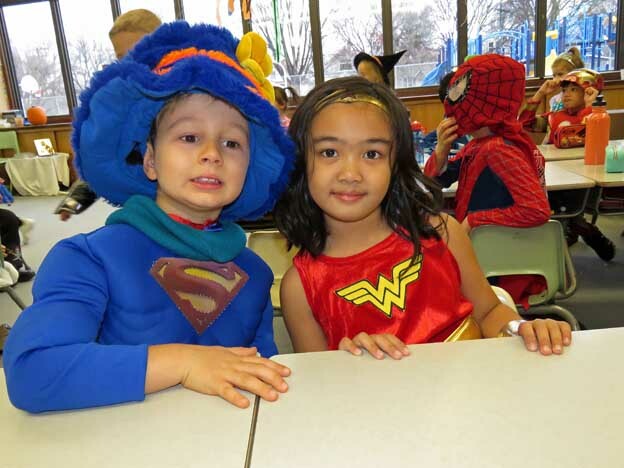 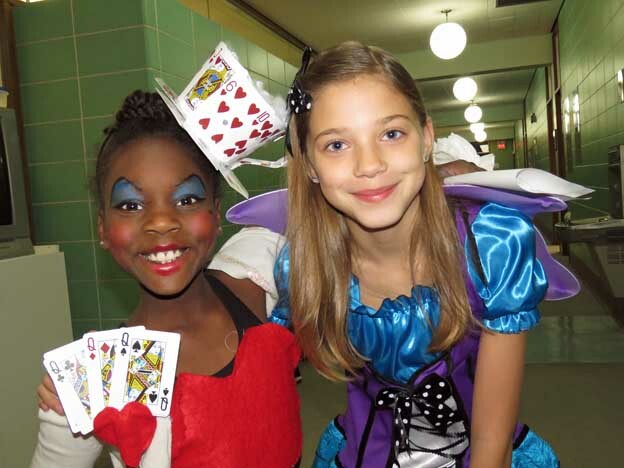 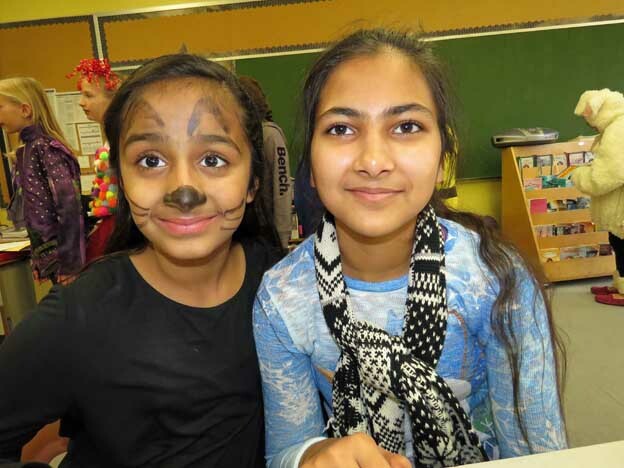 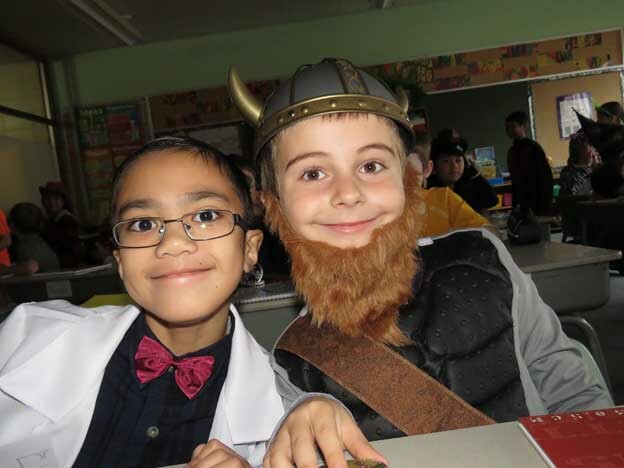 he students had a lot of fun coming to school dressed up for Halloween. 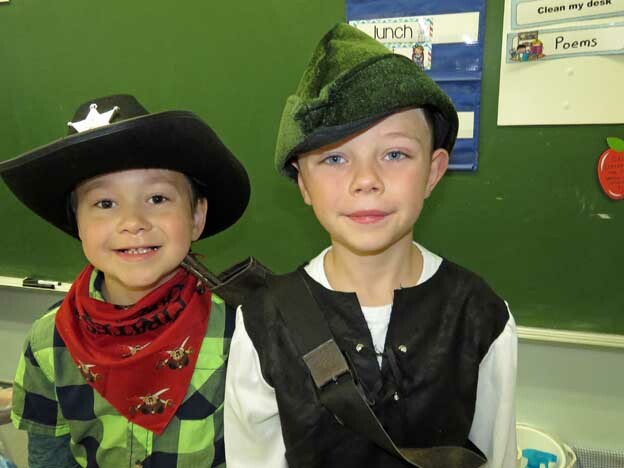 It gave them the opportunity to wear their costume twice – once during the day and again later that evening. 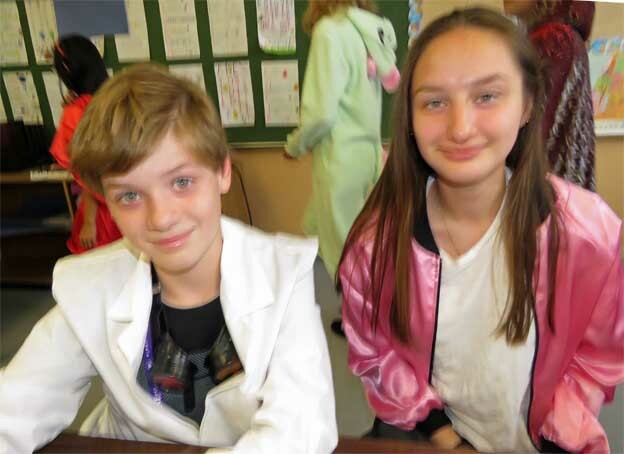 There are a few other N.U.T. 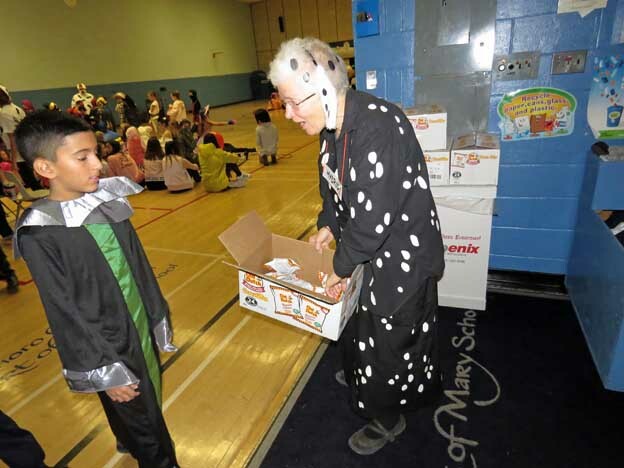 days spread throughout the school year, but most students agree that Halloween is the N.U.T. 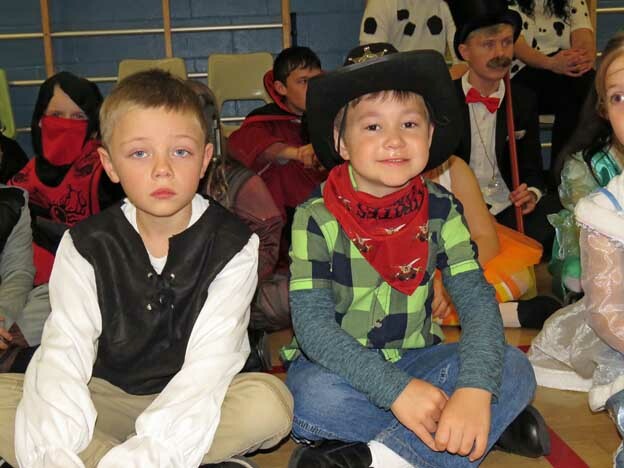 day they enjoy the most.